Iowa City is more than just “home of the Hawkeyes,” but also the home to a variety of delicious, locally-owned food joints. From to famously-delicious diner food, to artfully prepared gourmet sushi, Iowa City offers a host of unique dining options. While trying to list each and every great restaurant in town would be impossible, I’m going to highlight the very best food joints downtown Iowa City has to offer, no matter what you’re craving. Once the home to H.D. Short’s shoe shining business, Short’s has be a part of the Iowa City community since 1920. While the store has since been converted into one of the best burger joints in town, they maintained the motto of “Expert workmen, Best materials used and Prompt service,” and live up to it. 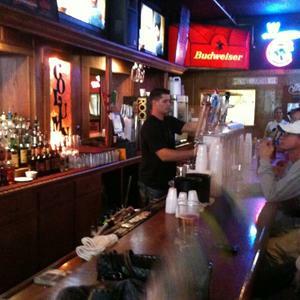 Short’s is where you can find the Iowa City guys coming together for a great burger and beer served up with seasoned French fries. While I and many other Iowa City ladies tend to opt for a lighter option on restaurant menus, don’t even try to count calories here. Short’s slathered burgers are simply impossible to resist. 18 South Clinton Street, Iowa City, IA 52240. 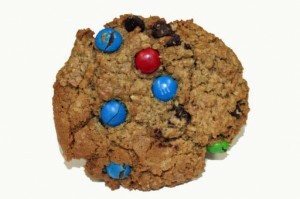 Open daily 11am-2am. 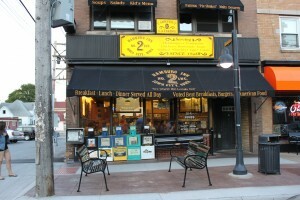 Easily the most recognized restaurant in Iowa City is Hamburg Inn. 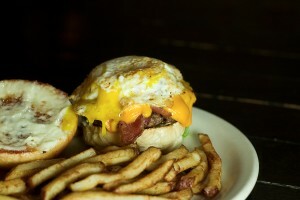 Known for its greasy and delicious American breakfast, burgers, sandwiches, and 1950’s characteristic décor, Hamburg Inn has been one of Iowa City’s most beloved places to grab a bite since its opening in the mid-1930’s. Diners come not to count calories, but to indulge in an array of tasty platters and Midwestern charm. Not only do the locals and visiting Hawkeye fans flock to the “Burg,” but it also has a history of serving famous diners such as Ronald Regan and Bill Clinton, and has been featured in the Washington Post, New York Times travel section, a list of magazines, and won an array of local awards for “Best American” and “Best Breakfast.” My favorite part of any trip to the Burg is topping my meal off with their famous “pie shakes,” which includes a milkshake blended with your choice of an entire slice of pie. Chowing on a combo of ice cream and chunks of apple pie is absolute dessert perfection in my book! 214 N Linn St Iowa City, IA 52245. Open 6:30am-11pm daily. For the past 50 years, Pagliai’s Pizza has been offering the area’s tastiest, award-winning pizza. 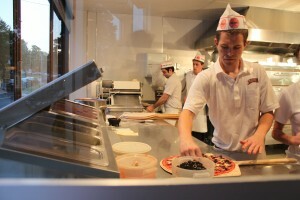 While time has passed, much has stayed the same, including their commitment to quality ingredients, and famously thin crust loaded with cheese and meat and veggie toppings, all served up by pizza boys dressed their paper hats and old-fashioned uniforms. I come for the mom-and-pop atmosphere, and always return for the delicious pizza. My friends and I always order extra since we believe it also make a fabulous next-day breakfast. For your next pizza craving, check out Pagliai’s and see why it’s been voted “Area’s Best” by the Iowa City Press Citizen for the past 8 years. 302 E Bloomington St., Iowa City, IA 52245, Open 4-11pm daily. Dine in or take out. Known for its quality steak, seafood, pasta and wine, Joseph’s takes Iowa City dining to new heights. 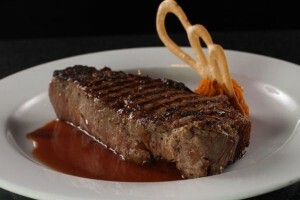 Diners can expect exceptional entrees and superior service, set in a trendy, yet romantic atmosphere. Drapery and subtle lighting hang from the walls in this sophisticated, Iowa City hot-spot, which has been open since 2005. Many have said you’ll find the best steak Iowa City has to offer at Joseph’s, but anything off the menu will not disappoint. Going to Joseph’s is about more than just eating a meal, but partaking in an elaborate dining experience. 212 South Clinton St., Iowa City, IA 52240. Open Mon-Thurs 5pm-10pm; Fri-Sat 5pm-11pm; Sun 5pm-9pm. Forget any assumptions you may have concerning a lack of quality sushi available in Iowa—because this place proves them wrong. 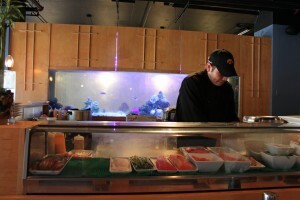 Takanami is not only one of Iowa City’s trendiest hang-outs spots, but also serves up gourmet, freshly-made sushi that tends to look more like works of art than consumable food. Takanami offers a variety of basic and specialty rolls, and has great half-price sushi happy hours on weeknights. Even if you’re not a sushi-lover, it’s still worth a visit to try some of their fabulous dinner entrees like the Kobe Beef Fillet or the Atlantic (fully cooked) Salmon. 219 Iowa Ave., Iowa City, IA 52240. Open Mon –Fri, 11am-2pm & 5-10pm; Sat 5-10pm; Sun5-9pm. 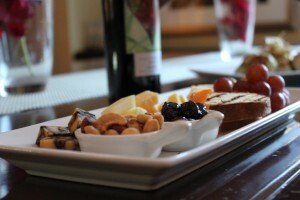 New to the Iowa City restaurant scene is the Share Lounge, which specializes in fine wines paired with delicious appetizers and “small plates.” This place is my favorite spot to hang out for hours on end, and relax an afternoon away. The upscale lounge is the perfect place to gather with friends to enjoy a great glass of wine over good conversation. If you’re looking for something more than just appetizers, they also offer a full lunch and dinner menu, as well. Don’t be fooled by menu items like “chicken quesadillas” or the “pulled pork sliders,” because while it sounds like bar food, everything here are classic favorites with a gourmet twist. When it’s warm, grab a table on their outdoor patio, and watch the pedestrians stroll, and listen to the street-side musicians perform in the very heart of downtown. 210 S Dubuque St., Iowa City, IA 52240. Open Mon-Sun, breakfast served, 6:30-11am; lunch served, 11am-5pm; dinner served 5-11pm. Recognized as the place Hawkeyes gather to drink, watch the game, and celebrate a win, the Sports Column has been one of the hottest Hawkeye hangout spots since its opening in 1984. Sports Column is situated in the center of downtown and is a great place to revel in pride when the Hawks score a touchdown. Also a great place on the Iowa City nightlife scene, Sports Column features many evening events including entertainment, contests, and drink specials. If you’re in the mood for good food, drinks and good time, check out Sports Column and see why it’s where the Hawkeyes hang. 12 S Dubuque St., Iowa City IA 52240. Kitchen Open Mon-Wed, 11am-9pm; Thurs-Sat, 11am-10pm; Sun, 11am-5pm. 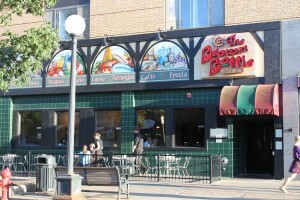 For its low lights, smooth music, and fine wines the Brown Bottle takes the cake for Iowa City’s best restaurant for a romantic atmosphere. Dining at the Brown Bottle is to experience the best handmade Italian dishes Iowa City offer in a truly romantic setting. Not only is this charming restaurant the best place for a date, but is remarkably reminiscent of Italy’s countryside its décor, food and atmosphere. Any of their pasta dishes are fantastic, and after studying abroad in Italy, I can attest that the Brown Bottle is truly reminiscent of romantic Tuscany. 115 E Washington St., Iowa City, IA 52240. Open Sun-Thurs, 11am-10pm; Fri-Sat, 11am-11pm. 201 S Clinton St., Iowa City, IA 52240. Open Mon-Fri, 9am-7pm; Sat, 10am-5pm, closed Sundays. Stephanie Weers is a student at The University of Iowa studying Journalism and Art History. She loves fashion, blogging, cooking, traveling and spending time with family and friends. Stephanie enjoys freelance writing for numerous publications, serves as a Fashion Editor for Verum magazine, and hopes to one day become a magazine editor.